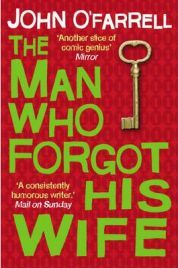 When you pick up a book called The Man Who Forgot His Wife, you can be pretty confident about what you are going to get: a story about a man who has forgotten his wife. If that book happens to be brightly coloured and authored by John O’Farrell (a writer who claims “Spitting Image” amongst his many credits) then you can be pretty confident that you are going to get a comedy. This is hardly the first time that amnesia has been mined for its potential comedic value (I am shuddering at the thought of “50 First Dates” here), but this book uses it in a surprisingly effective and moving way. Yes, it is a comedy about a man who has forgotten his wife, but it is also a poignant story and the best comedy is often the most poignant. The man in question is Vaughan, a middle-aged teacher who at the start of the story is sitting on a tube train pulling into Hounslow East, unable to remember where he is going. For that matter, he can’t recall where he has come from, how long he has been on the train or even what his name is. Without any personal items to remind himself of his identity, he spends a frightened few hours wandering around London before winding up at a hospital, unable to tell the staff very much at all. A week later, he is still there. No family has come to claim him, and all the doctors can determine is that he has suffered a rare neurological condition called a psychogenic fugue, which has erased all personal memories from his brain for some unknown reason. It is only by chance that his best friend Gary finds him, and then he has some unfortunate news for Vaughan: the wife that he cannot remember is in the process of divorcing him. With his memory freshly blanked, Vaughan cannot help but be newly smitten with his soon-to-be-ex Maddy when he meets her in the divorce court, blushing and giving shy waves across the room. Without the ability to recall why they were splitting up and with wonderful memories of their early relationship starting to return, Vaughan becomes convinced that Maddy’s hostility towards him must be down to the actions of her divorce lawyer – and he sets out to try and win his old family life back again. It is an interesting set-up, one poised to take full advantage of Vaughan’s memory problems as well as the great comic potential of relationships. We cannot help but root for our hapless hero, even as we find out what an annoying and selfish man he had been before his slate was wiped clean for him. The book does raise an intriguing idea in this plot: if we are the product of our experiences, how might we change if we can no longer remember those experiences? Vaughan does ponder this himself for a while, after starting to understand how much his fugue state has altered him; if nothing else, it makes him shave off his scruffy beard (grown in the 80s after learning that Margaret Thatcher disapproved of them). The comedy in The Man Who Forgot His Wife isn’t of the laugh-out-loud variety that I was perhaps expecting, but that is not necessarily a bad thing. Whilst treating the subject of amnesia in a sensitive way, it manages to range from being witty and amusing to being genuinely sad in places, as we follow Vaughan’s love story in reverse. Some of the jokes fell a bit flat for me (although I suspect that they might be funnier if you have a greater familiarity with London) but on the whole they hit the mark. O’Farrell is also a good observer of human behaviour: the section where Vaughan starts to remember irritants and arguments with Maddy highlight some of the many things spouses find bemusing or annoying about each other with sharp insight. It certainly made me smile, and I found it a short but satisfying read (although perhaps a bit too short to fully justify the £14.99 hardback price tag). No Comments on "The Man Who Forgot His Wife"